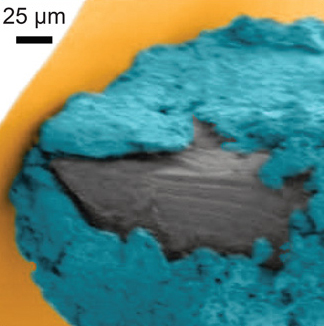 Researchers turned this nanoscale probe of tungsten (gray) coated with lithium oxide (blue) as a battery when pressed against silicon (orange) to study how pressure affects electrical current. Scientists at the University of Maryland have found a ‘distress signal’ that solid-state batteries send out when under pressure. This signal can be used to diagnose problems in degrading batteries, a key challenge in creating longer-lasting batteries. To figure out this stress signal and what it means, a team of physicists and chemists at the University of Maryland had to start from the very beginning. Science doesn’t yet understand very well the effect that mechanical stress – pressure – has on solid-state batteries. So postdoctoral associate Jonathan Larson mounted a solid-state battery on the end of a microscale metal tip. He pressed the battery against a solid surface several times to generate high pressures and studied the current coming out. This is a new way to measure how stress in batteries effects battery current and collaborators call the approach “pascalammetry”: “pascal” for applied pressure and “ammetry” for measured current. The way the electrical current behaved under pressure didn’t follow the standard laws that govern how ions move back and forth in a battery. So Larson had to add to the equations for those laws. Professors Janice Reutt-Robey and Sang Bok Lee of UMD’s department of chemistry & biochemistry led the research. The team also used extremely high-powered microscopes to take pictures of the surface of the battery probe, which showed cracks developing as the battery was pressed. The probe-turned-battery was only about 100 nanometers across, or a thousandth of a millimeter. Any battery that shows those particular distress signatures is showing that it has pressure applied. This could be useful for scientists who observe a strange behavior in the current of their batteries – being able to interpret this distress signal as evidence of pressure is like a yelp when a stranger steps on your toe. Batteries can come under pressure as they age for a few different reasons – as small amounts of trace chemicals in the batteries interact, gas can build up; or ions can get stuck at the active ends of the battery and distort the shape. The “microbattery probe” was made in the University of Maryand’s clean room Fab Lab facility, part of the Maryland NanoCenter. The results were published June 8 in the journal Science Advances and was funded by Nanostructures for Electrical Energy Storage, a DOE Energy Frontier Research Center, headquartered at the University of Maryland.